Why am I such a terrible procrastinator?! 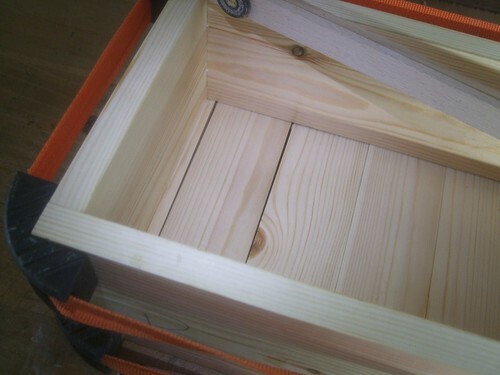 It’s been over three-months since I started this simple pine box for storing bathroom cleaning equipment yet, this is hardly the first instance in which I’ve been known to start one project and to then ignore it for many, many months (there’s still an unfinished fruit bowl in my workshop, somewhere!). If I’m honest with myself, I really haven’t been in the mood to do any woodworking for a long time. It probably goes back to when I finished college (which I really enjoyed) two-years ago, and perhaps also the lack of reception following the two furniture exhibitions I was involved in that summer. I’m moving back to my mum’s in a couple of months (to save money, cut down on overtime hours and it’s also closer to the workshop) but, that’s only really a temporary measure until she sells up. At which point, I also expect to lose my workshop. I just cannot bear the thought of taking everything with me… Anywhere. Of course, I’ll hold on to all the hand and power tools that I can carry; it’s mostly the larger stuff that will have to go. 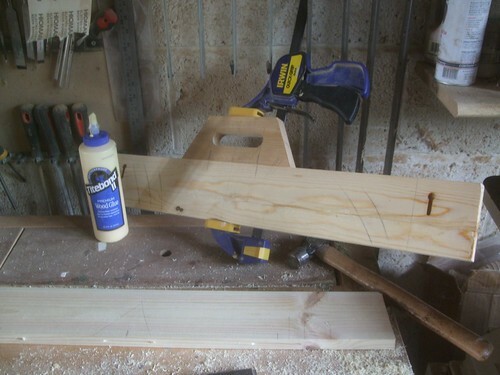 I may just look at ‘down-sizing’ to working with power tools alone… Expect a further post on this nearer the time! I’m sorry for being so absent from this site. Not just lately but, for much of the last two-years, in parts. I do suffer with some form of depression and there are aspects of my daily life that don’t help this (a factory-job with long hours and low pay; working with woodworking machinery but without utilising skill, being one example). On a brighter note, I feel good having met someone special last weekend and I hope that we can build something between us in good time (in a non-woodworking sense! ), even though we’re strictly friends right now. To be fair, this box has been ready to assemble for some time. As you will have seen last time; I got most of the work done in that one weekend. All I needed to do prior to gluing was to give all the interior surfaces two coats of Polyvine Wax Finish Varnish, which is a non-yellowing clear, water-based varnish designed to give the non-plastic texture of a traditional wax coating. 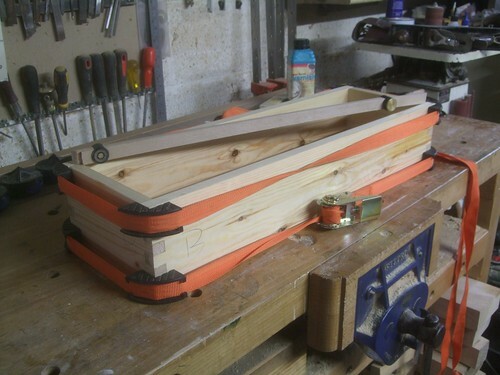 I went with a pair of ratchet straps and corner blocks on this; I just couldn’t see the practicalities in trying to position twelve sash cramps (not that I own so many!) so that I could squeeze the box together in two directions at the same time! It worked so well that, with the finger joints having already been cut so accurately, I quick check for square (with this Veritas gadget) told me that everything was perfect! One suggestion I do have is to cut your joints so that the end-grain finishes ‘below’ the outer surface of your box. That way, you can clamp it up comfortably without having to use blocks, as the protruding end-grain doesn’t get in the way. When I cut and thicknessed the baseboards (slats), I did allow a few extra millimetres in width to allow for expansion along the length of the box. Maybe I allowed a little too much; maybe not. There’s enough play that I should be able to even these out a bit, anyway. While the top is glued up (from narrow, edge-jointed boards) and waiting to cure, I continued working on the central divider, which I’ve now decided will be pocket-screwed to the ends of this box. 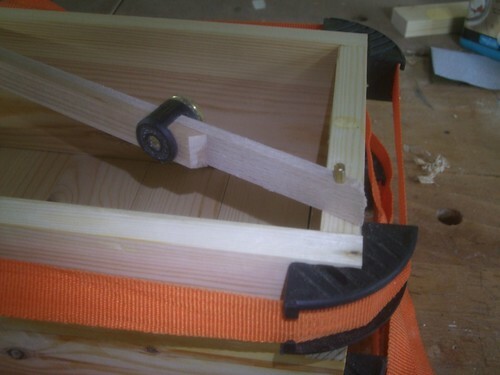 It’s just so simple and avoids the risks associated with fixing in to end-grain. That smaller section on top (for the handle) was cut and shaped to size before being biscuit-jointed to the longer board’s edge. I’ve also decided to leave the keyhole slot in place (right-hand side) as this is a ‘recycled’ project… Plus, it wouldn’t be easy to disguise that – even with a pocket hole plug cutter (more on that purchase soon!). I’m hoping I can pick myself up enough to get back in the workshop tomorrow and get this one step closer to being complete. My new friend works most weekends and mostly takes time off during the week while I’m at work, which does make it very difficult to see each other. Perhaps I should start browsing the job sites again, as I’ve just past the one-year mark in my current place, with no future prospects apparent and little satisfaction to gain from the day-to-day running in the mill (…Literally! ).